We’d love your help. 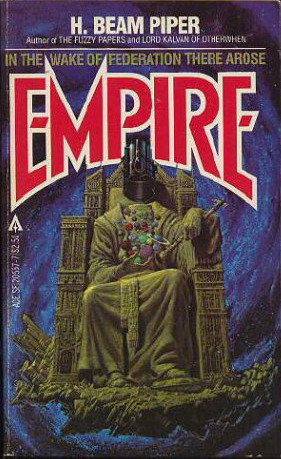 Let us know what’s wrong with this preview of Empire by H. Beam Piper. To ask other readers questions about Empire, please sign up. Five short stories, some excellent some just good. Worth a read. Not as good as the previous edition Federationin fact Edge of the Knife is contained in both volumes, and The Return is set 200 years after War that eventually gave rise to The Federation. Having said that this does one of Piper's finest short stories A Slave is not a Slave which is a wonderful reworking of The Russian Revolution and is a definite must read for any Piper fan. I can't help but wonder what I would have given this old book of scifi stories if I had read the book when it was published. Maybe 4 stars for the future concepts, maybe 2 stars for the simplistic pop-psychology. Some of the stories were better than others. This future history was cut short by the suicide of the author. It is interesting, but not inspiring. Collection of stories, linked by being part of his Empire stage of Piper's future history. But they are separated by hundreds of years so there is no real continuity. And the tech does not seem to advance and regress but remains at the same level. Overall, not as good as the Fuzzy books. Henry Beam Piper was an American science fiction author. He wrote many short stories and several novels. He is best known for his extensive Terro-Human Future History series of stories and a shorter series of "Paratime" alternate history tales.